More than half of the energy the world produces is wasted. Even worse, the biggest contributor to this waste is in the process of energy production itself. However, recent developments in quantum machine learning and nanotechnology could unlock the solution to the ever-growing energy crisis that affects over 1.2 billion people. Despite the upward trend in energy production, there has also been an upward trend in the proportion of energy waste. Last year, 66% of our energy was wasted, and even more surprisingly, most of it was lost in the process of electricity generation itself. 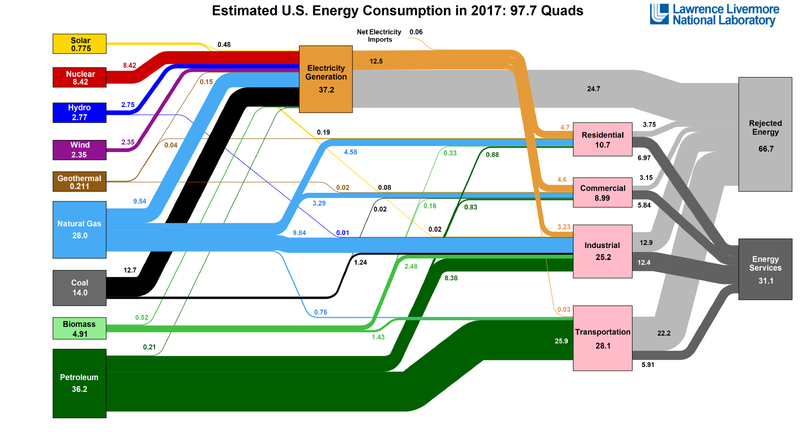 Not only are coal and natural gas bad for the environment, they’re also extremely inefficient, losing almost twice the amount of energy they produce (along with nuclear fission and hydroelectric generation). All of these energy sources suffer from the same fundamental flaw: they all rely on steam turbines — the same ones that were used over 50 years ago. Turbines are used to convert large amounts of kinetic energy on the molecular level (think heat) into usable electricity by directing rising steam through its rotor. The problem is, this mechanism is only capable of harnessing energy from a thermal gradient, i.e. the steam has to be surrounded by a cold medium for it to work, and thus, energy is spent on cooling the apparatus. If not steam turbines, what should we be using? As it turns out, biology has spent a few billion years developing this process: ATP synthesis involves the conversion of kinetic energy in moving protons into chemical energy using an enzyme. With the right mechanisms built into a nanostructure, creating a synthetic molecular machine for this process could completely disrupt the energy sector. The mechanism of the ATP synthase enzyme. There’s no instruction manual for the optimal molecular structure, but quantum machine learning offers the solution: quantum generative adversarial networks, or QuGANs, have the potential to simulate and optimize the properties of a given molecule. By iterating over hundreds of thousands of possible nanostructures, we could create the blueprints for the perfect molecule. 1.2 billion people are still without a source of electricity. The developed world is currently caught up in optimizing energy generation incrementally, but true change depends on a fundamental shift in the way we think about energy. The vision behind EnergyInq (energyinq.com) is the outright replacement of steam turbines to dramatically increase the efficiency of energy generation, which drives our mission to power the world at a fraction of the financial and environmental costs.